The National Weather Service saved thousands of lives in Oklahoma--so why are we cutting its budget? Many heroes asserted themselves in Oklahoma yesterday, from the first responders digging through the rubble for survivors, to the teachers who shielded children from the massive tornado that touched down as the school day was ending. While perhaps not as heralded, certainly the experts at the National Weather Service deserve some credit for saving lives as well. One of the best ways to prevent high body counts when tornadoes barrel through populated areas is to warn residents ahead of time—which is the job of the NWS. They did it well yesterday, issuing early warnings allowed countless people to seek shelter before mayhem arrived. But the NWS has, in recent years, suffered under serious budget restraints placed on it by deficit hawks in Congress and the White House. Far from the public view, the NWS is starting to come apart at the seams—and the full effects of the sequester haven’t even been felt yet. So what if, next time, the NWS isn’t able to do its job as well? The tornado in Oklahoma yesterday provides a good case study for both the crucial import of the NWS’s work and the very small margin for error. Tornadoes present a particular challenge because, while the conditions that create them are easily identifiable—warm, moist air from the gulf colliding with warm, dry continental air and cold, dry air from the Rockies—the tornadoes themselves are incredibly unpredictable. Scientists still are not sure why some thunderstorms produce them and others do not. When a tornado appears, the National Weather Service sounds the alarm. In Oklahoma on Monday, the alert came sixteen minutes before the tornado actually touched the ground, which is three minutes more than the thirteen-minute average warning the NWS provides. It triggered emergency broadcast alerts throughout the region and blaring air-raid sirens that allowed hundreds of thousands of people to seek shelter. As a tornado is forming, NWS workers are synthesizing a rapid amount of data from radar, satellites, on-the-ground meteorologists, and citizens calling in what they see. The alerts have to be accurate—and they have to be quick. “The adrenaline is building up. You’re looking at storms that you know are just really bad,” Dan Sobien, president of the National Weather Service Employees Organization, told The Nation. “It takes a special kind of person because you have to juggle ten or fifteen balls all at the same time, and then make life-and-death decisions based on that. 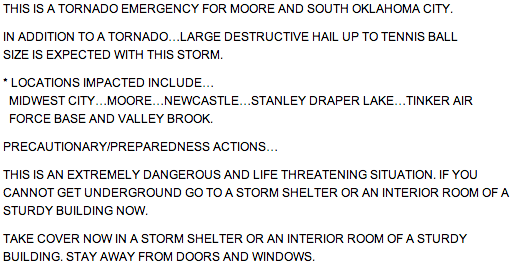 This no doubt saved hundreds of lives in Moore. According to ABC News, the Plaza Towers Elementary School does not have an underground shelter—but the fourth, fifth and sixth grades had enough time to evacuate to a local church, where they remained safe. The entire school building was destroyed. The NWS deserves enormous credit here. But what if it wasn’t up to the task? That’s an increasingly real possibility. Just this month, Sobien’s group, which represents 4,000 employees of the National Oceanic and Atmospheric Administration (of which NWS is a part), issued a warning that the budget battles are imperiling crucial NWS functions, and creating “[r]educed efficiency and accuracy for tornado events due to reduced alertness of short staffed offices.” Hurricane monitoring and response is also endangered, along with crucial wildfire monitoring efforts and a wide array of other NWS activities. This is all occurring at an agency that could badly use more money, not less. The satellite equipment there is badly antiquated, and the Government Accountability Office said the “satellite gap” is one of the thirty biggest threats facing the federal government. In fact, amidst all the turmoil yesterday, the NWS suffered some notable problems. In the evening a communications outage affected offices in Chicago; Anchorage; Binghamton, New York; and Kentucky, according to Sobien. The Nation confirmed this outage with an official at the NWS office in Chicago. Those ended up being trivial outages, but next time might be different. If a disaster strikes where a NWS office is under-staffed, it’s easy to see how lives could be lost. 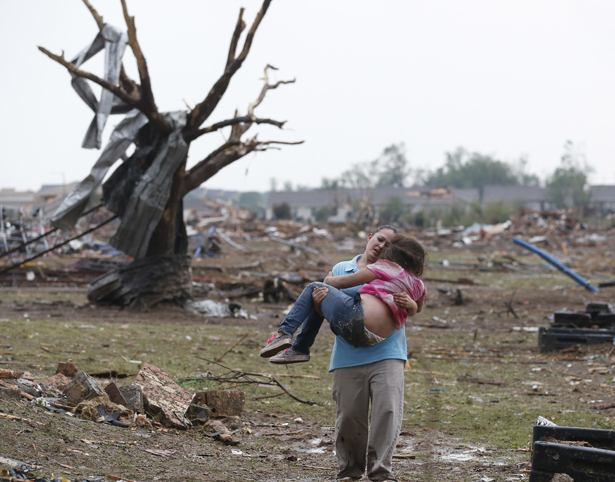 Here’s how to help Oklahoma after yesterday’s devastating tornadoes.